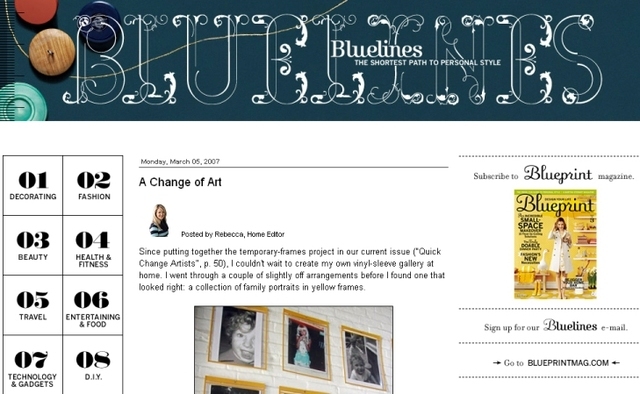 A sharp-eyed Dmitry Linkov pointed out that Bluelines, MSLO’s Blueprint magazine blog, has enabled comments and officially joined the conversation. As you’ll see by the picture to the right, I’m not taking credit. I’m just glad the Blueprint editors are taking full advantage of their blog. UPDATE 2: Bluelines has since enabled comments. More on that here. Martha Stewart’s global empire recently joined the blogosphere with Bluelines. The blog’s design is nice enough. So why am I panning it? Two items raise my ire. If you’re news release is about the launch of a blog, you might want to include the blog’s URL. MSLO drives you to the Blueprint Magazine web site to access the blog. This Web 1.0 mindset is made all the more annoying because the blog link is a banner and not an obvious part of the site navigation. Look at Our Shiny New Blog! The blog comes complete with social media chicklets for RSS, Digg and Technorati. But it does NOT accept comments. Having a blog without accepting comments tells me that Martha Stewart wants all of the credit for blogging, but doesn’t want any of the conversation. What’s the point? How did I get this news release? 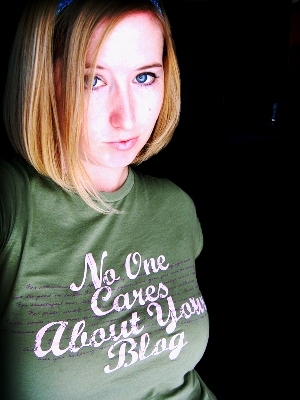 The domestic doyenne was a frequent blog topic during her ImClone scandal. Thanks to Blogger, Martha Stewart & Public Relations still lives on. And I still get comments from confused consumers complaining about a purchase or asking me to put them in touch with Martha. Does the blog look like an MSLO joint to you? All is quiet at my Martha Stewart blog. The blog was a time-based project revolving around Martha's crisis. Well, someone brought her up over at the FC Now Blog Jam. So I responded. This kind of interaction is exactly what Heath Row was looking to create. Stop by and join in. 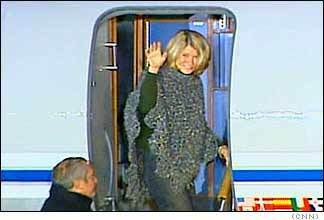 Whether you consider Martha Stewart a criminal, hero or victim, her sentencing signals the end of a long, punishing crisis. This analysis will focus on what Stewart did right and wrong from a public relations perspective; and how the scandal was shaped by the media and corporate reform. Weighing in on this topic are authors Eric Dezenhall and Al Ries. Dezenhall is an oft-quoted expert in damage control and the author of "Nail 'Em: Confronting High-Profile Attacks on Celebrities and Businesses." The basic history of Stewart’s crisis will not be covered here. If you need a refresher, check out this timeline. Or just follow today’s news. The media feeding frenzy around Stewart’s fall from grace began after her now infamous appearance on CBS' The Early Show. During her then weekly cooking segment, she was asked about the ImClone issue. Stewart tried to dodge the question and noted she wanted to focus on her salad. Media training executives around the globe quickly added the footage to their training tapes of how not to handle direct questions. “This interview took place too soon after the ImClone story broke,” says Dezenhall. “She was too flip and hadn't endured the crucible long enough to show human depth. When you live by personality you can die by personality. There are acute limits to what you can do with someone with Martha's personality. Stewart’s first public appearance during the scandal was the most damaging of all. We could note this snafu proves out the importance of media training, but lets consider the bigger issue of brand strategy. Crisis communications’ and media training's role in a brand strategy is to preserve and reinforce the brand—when used proactively. Far too often, they're used reactively with mixed results. Stewart fell silent after the CBS spot turned bad into worse, canceling public appearances. She hired The Brunswick Group to handle damage control and help create a crisis strategy (Citigate Sard Verbinnen now handles this work). She should have engaged a crisis team the day the scandal broke. Especially during a crisis, silence isn’t golden, it’s guilty. Until Martha Talks was unveiled, the media had no comment from Stewart and they were left to assume, and assign, guilt. Martha Talks proved the effectiveness of the Web in crisis communications. And as we’ve discussed, a blog could also support crisis communications. Martha Talks tells Stewart’s side of the story. It generates support and presents her as a normal person—not the uber-perfect home heroine her shows and the media make her out to be. The site is humble, subtle and presented in a way that communicates, while Stewart maintains her innocence, that she realizes the serious nature of her legal issues. Timely trial updates, statements from Stewart’s legal team and a library of different op/eds written on her behalf populate the site. It’s become a news source, getting Stewart’s point across without her having to field interviews. Of course, she did conduct strategically-timed interviews with Larry King and Barbara Walters. Stewart also translated traffic stats into a show of support. The site has received more than 34 million hits and more than 170,000 supportive emails since it was launched in June, 2003. This information is brought to your attention on first view. Personally, I think she could have employed a blog or comparable comments/bulletin board section to build on the e-mail support base the site developed. The danger is that anti-Stewart fans can also post, but I think the pros of pushing her site further to tap into this audience outweigh the cons. “Stewart's Internet campaign was quite good,” says Dezenhall. “It allowed her to mobilize and to communicate with supporters. In the end, it didn't turn the jury, but it was a good move to establish the Web site. The article explores brand personification—when the brand is tied to an individual. The main point is to strike a balance when you rely on the CEO as your brand. "Strike a balance, where the company benefits from an appealing public personality like Martha Stewart and Donald Trump or Ralph Lauren and Michael Dell, while it builds a strong identity that doesn't rely on the individual. Martha Stewart Living Omnimedia (MSLO) is moving in that direction with products and projects that do not bear Martha's name. It will be interesting to see how much more they will need to change at MSLO to strike a balance. MSLO and Martha Stewart have been very inconsistent on how much MSLO’s house of brands relies on Stewart. MSLO is quick to point out that Stewart is one employee of a large company. How could one person possibly account for the bulk of the brand? Then after the guilty verdict, the lawyers had everyone saying that MSLO could not survive if Stewart were in prison. There was lots of waffling here. And not the Belgian kind, made from scratch for your next Sunday brunch (you KNEW there would be a domestic reference in here sooner or later). The New York Times brings us an interesting fact: "Since last June, when Stewart was indicted on charges of conspiracy and obstruction of justice, MSLO has applied for 12 trademarks—none of which include her name." The article notes, "trademarks are a capital asset—property a company can own to enhance a brand, product or service. An exclusive name or image often increases a product's value." Based on how the sentencing goes Friday morning, I'm predicting that MSLO might even start referring themselves as just that...MSLO, or their ticker symbol MSO. I call it pulling a KFC. Unfortunately, this is no longer an accurate statement as KFC tries to distract us from the sizzle and crackle of the deep fryer by evolving from Kentucky Fried Chicken to KFC and now to Kitchen Fresh Chicken? They should have stopped at KFC. Personally, I think Stewart is a victim of much needed corporate reform. Keep in mind, she’s not being convicted of insider trading, rather lying during the insider trading investigation. Her worth has plummeted from billions to millions and she lost the helm of a diverse company she built all by herself. Hopefully U.S. District Judge Miriam Goldman Cedarbaum will hand down a sentence fitting the crime. The Justice Department has charged more than 700 people in the two years since the Corporate Fraud Task Force was formed. But Stewart is the celebrity CEO everyone recognizes. This sentence sends a message to corporate America. Dezenhall notes, “Legally, Martha isn't a victim because she was convicted of breaking the law. Her career and her business certainly have been victimized. There is a witch hunt component to this on top of the legal violations. Her celebrity and her success played a role in the intensity of the scrutiny and the harshness of the punishment. The Big House or Stewart’s Farmhouse? August 3rd is Stewart’s birthday. Will she spend it in the big house or at her farmhouse? We’ll find out, but legal experts estimate the prison sentence could be 16 months or more. Will a prison sentence spell the end of Stewart? Of course not. “Stewart will be back,” says Dezenhall. “Americans enjoy the whole process of crucifixion and resurrection. A wounded Martha may be a lovable Martha. We do love to see the mighty suffer. A Martha comeback would be a story the media would love to do and that may dictate things. This post was created for Global PR Blog Week 1.0. Be sure to visit the site to comment on this post and dig into some other great content. The mini-blog is now live. So click here for more information on Martha Stewart & Public Relations. Or, sigh in relief as there will be no more Martha Stewart-related posts on this blog. It's a good thing. I suspect the new Martha blog will be temporary. Once the trial ends, I will certainly stop updating it. The new Strategic Public Relations blog, complete with RSS feed, is currently in beta testing. You'll hear more about that yet this month. In the meantime, stay right here for current posts. Now I have to go register the two new sites with about 40 gajillion blog search engines. Oy. If you're reading this, Blogger is back up. The service outage is a sure sign that Strategic Public Relations needs to move. So I have signed up with a new blog hosting service to upgrade and offer you an RSS feed. Once the new house is in order, I will unveil the new address so you can update bookmarks, edit links and subscribe to my feed as you see fit. Until then, keep your browser pointed here. I'm also creating a sister blog for all of my Martha Stewart public relations content. The Stewart thread was taking on a life of its own and impacting Strategic PR's focus. So I have two new blogs I am working on. Both should debut prior to the Martha Stewart trial beginning on January 12. There is nothing quite like a deadline to motivate. Michael Jackson unveiled a Web site to issue official statements regarding his case. The media circus following him makes this an easy choice over holding press conferences. But the site is not helping his case. My personal feelings on this case aside, a one-way communication approach is a step above no-comment and silence strategies—a barely discernable step. The site has no e-mail link and no method of contact listed for fans to show their support. This is a critical error. This eliminates Jackson's ability to promote the support he might receive. Look at Martha Stewart's Web page as spokesperson strategy. In less than six months Martha's site has received 15 million hits and nearly 70,000 e-mails from supportive fans. Jackson's absence of contact information connotes guilt and that he does not care what his fans think. The Martha Interview kicked off sweeps this weekend. It was a masterpiece of the Martha Stewart public relations efforts to date. Even the Save Martha and Martha Talks Web sites were mentioned prominently. Hopefully potential jurors saw it, as her trial begins on January 12. Martha was on strategy, distancing herself from MSLO. In fact, the interview went to great lengths to show Martha Stewart as a person. If you are going to be perceived as a victim, you must first be perceived as accessible, normal, less than perfect—real. The interview did just that. It took place at her home, it included a tour of her hometown and it included plenty of childhood pictures. The interview brought up some excellent points, from the fact that she has already lost half of her $1 billion fortune to the fact that she could be innocent. Editor's Note: The public relations strategy around the Martha Stewart crisis is my focus—not her guilt or innocence. She ended the piece with an adaptation of her trademark phrase and noted "it's not a good thing." Well done. day, K-Mart and Martha Stewart need each other to sell products and make money. K-Mart's decision to use Martha in its ads, and Martha's decision to appear in them, are both business decisions. And in business, "it's all about the benjamins." Martha has thrown me for a loop folks. She'll appear in a new K-Mart ad debuting during this weekend's World Series. Side note: I'm bummed the Sox and Cubs won't be playing in the Series. But, where would we be without their curses?! Each team's curse is a thread woven tightly into their respective brands. You come to expect it. It makes you an even bigger fan. Martha and K-Mart's strange marriage makes MSN wonder if any publicity is better than none at all. It also asks who needs the publicity boost more—Martha or K-Mart? Regardless of the answer, it will get both camps more attention. This news has me scratching my head—up until now she has been distancing herself from her company. But it is good to see some twists and turns in the Stewart saga.